The adventure starts here! The new version of Polygon Xtrada has finally arrived. With newly enhanced features, Polygon Xtrada 8 provides complete bike setups that every rider dream of. 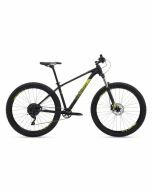 This premium mountain bike is the continuance of the highly popular Xtrada series. Prepare your first ride journey ahead with this highly anticipated mountain bike in 2018. Similar with its predecessor, the Xtrada 8 mountain bike uses the ALX super light 6061 hydroformed aluminum frame for the best resistance and strength even in extreme conditions. The internally routed cables prevent them from getting snagged on trees or rocks while riding. When it comes to the fork, Xtrada 8 adopts new "boost" standard with a 120 mm travel suspension fork. A lockout switch is attached to the handlebar to rapidly change from Open to Lock position and gives you total control for the bike's moves on the trail. The Xtrada 8 utilizes Wheel Fit Size System, whereby each frame is paired with the wheel size that best fits the rider for more optimal performance. The 27.5" wheels come with S, M, L frame sizes and the 29” wheels come with M, L, XL frame sizes. The wheels are wrapped in Schwalbe Tough Tom tires designed specifically for rough trails. The bike also uses Entity saddle to bring more comfort for the riders. Whether you are a professional cyclist or just looking for a high racing quality bike, Polygon Xtrada 8 is the one for you. The spesifications, colors, and availability of the products can be subjects to alter without prior notification.